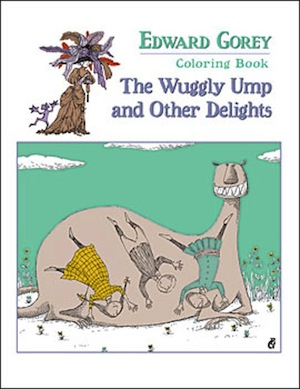 Pomegranate’s The Wuggly Ump and Other Delights coloring book features 22 illustrations by Edward Gorey. Coloring pages are blank on the back so they can be cut out and displayed. 48 pages. Dimensions: 8.5" x 11". The artist Edward Gorey (American, 1925–2000) created a diverse menagerie ranging from Menacing Monsters to Sleepy Cats. One of his creepiest Creatures was an Ump renowned for its Wuggliness. Mr. Gorey drew the Ump, from its “little wilful eyes” to the tip of its snakey tail, and he wrote down its scarey story. The whole thing is here for you to color, along with some other pictures of Cats, a Lion, several Little Girls, and two Ladies in Very Big Hats.